Susan G. Komen Race for the Cure® Series is the world's largest and most successful education and fundraising event for breast cancer ever created. Thursday Oct. 12 and Friday Oct. 13, 3:00pm - 7:00pm, and Saturday Oct. 14, 9:00am - 1:00 pm. You can also pick up your packet on race day, see below. Race site opens to the public at 5:00 a.m.
Susan G. Komen is the world's largest breast cancer organization, funding more breast cancer research than any nonprofit, and provides funds that support vital services for those who are facing the disease. Komen was founded by Nancy G. Brinker, who promised her younger sister, Susan G. Komen, that she would dedicate her life to finding an end to the disease that claimed Suzy's life. Susan G. Komen Hawaii is dedicated to combating breast cancer at every front. Our Vision - A world without breast cancer. Up to 75 percent of the Affiliate's net income goes toward funding grants to local hospitals and community organizations that provide breast health education and breast cancer screening, and treatment programs for medically underserved women. On a national level, the remaining net income supports Komen's research portfolio that funds groundbreaking breast cancer research, meritorious awards and educational and scientific programs around the world. 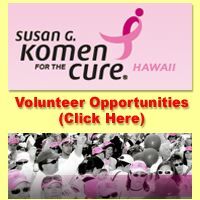 The Hawaii Affiliate of Susan G. Komen, established in 1999, sponsors fundraising events including the Komen Hawaii Race for the Cure®.In 1995, the first Komen Hawaii Race for the Cure® was held in Honolulu with 800 participants. 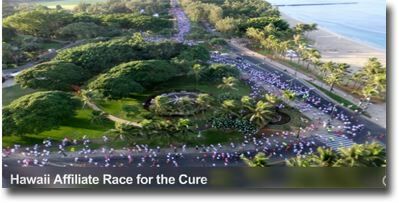 The Annual Susan G. Komen Hawaii Race for the Cure® continues to grow each year. Our goal is to have 7,000 runners or walkers participating this year, with the shared goal to raise funds to support screening, treatment and prevention through education for the underinsured and uninsured women of Hawaii. 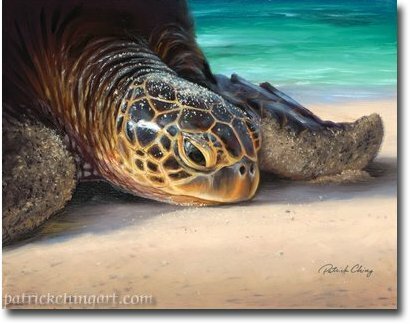 Mission Focus - To expand Komen's mission throughout the Hawaiian Islands by supporting and promoting collaborations among Hawaii's healthcare providers, businesses and community organizations; enabling implementation of culturally sensitive education, screening and treatment programs; thereby translating our vision into reality. Whether you are a golfer, a bowler, a chef or a runner, you can contribute to the fight against breast cancer 365 days a year. By participating in the Susan G. Komen Race for the Cure® or another Komen event, you become part of a grassroots network that has changed the way the world talks about and treats breast cancer. You can make a difference as you celebrate survivorship, honor those who have lost their battle, and most importantly, raise funds and awareness for the fight against this life-threatening disease. There are many different ways to support Komen's mission. We offer a variety of events, from bowling to cooking to golfing and driving, in an effort to raise money for and awareness of our battle against breast cancer. There are opportunities to join the fight where you live, work and play. Breast cancer is a type of cancer where cells in the breast tissue divide and grow without normal control. Except for skin cancers, breast cancer is the most common cancer among women in the U.S. Breast cancer knows no boundaries - be it age, gender, socio-economic status or geographic location. But there is hope. Thanks to heightened awareness, early detection, improved treatment methods and increased access to breast health services, people have a greater chance of survival than ever before. Making sense of the ever-changing world of breast cancer can be very overwhelming though. 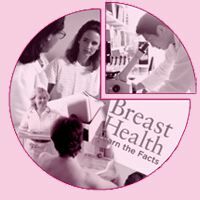 The Understanding Breast Cancer section of komen.org is your one-stop resource for the latest information on breast cancer risk factors, early detection and screening, diagnosis, treatment and support. You can also find information on integrative and complementary therapies, life after treatment, quality of care and much more. The Understanding Breast Cancer section was co-developed with Harvard Medical School faculty and Dana-Farber/Brigham and Women's Cancer Center staff. The Susan G. Komen Race for the Cure® Series is the largest series of 5k run/fitness walks in the world. You can run or walk the 5k route, with a team or as an individual. All registration fees include the official Komen Race for the Cure T-shirt and Race bib. Register to walk with us in either our 5K or one mile event. Register to run the Race in either our 5K or one mile event. Take your participation in the Race to the next level. Registration fees get us to the start line, but your fundraising helps to save ives and fund research. You'll be surprised how easy it is to start! Fundraise, make a great impact and be rewarded. Whether you register to walk or run, if you indicate that you are a breast cancer survivor during registration you will receive a pink survivor T-shirt, hat and bib along with your Race T-shirt. Be sure to take part in our Race Day Survivor Recognition Program generously sponsored by Zeta Tau Alpha. We are here to end breast cancer forever! 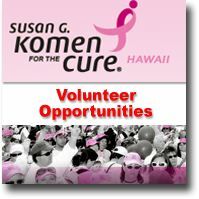 The Hawaii Affiliate of Susan G. Komen for the Cure® is dedicated to combating breast cancer at every front. Up to 75 percent of the Affiliate's net income goes toward funding grants to local hospitals and community organizations that provide breast health education and breast cancer screening and treatment programs for medically underserved women. Learn how to volunteer.